In a bid to strengthen the spirit of collaboration and sharing among NRENs in the UbuntuNet Alliance membership region, the Research and Education Network of Uganda (RENU) extended an invitation to the Zambia Research and Education Network (ZAMREN) to nominate and send a network engineer from its community to help facilitate a Scalable Campus Network Design training workshop which RENU organised and held in Uganda from 4-8 April 2016. Realising the importance of the good gesture shown by RENU, ZAMREN sent network engineer Emmanuel Mukwesa to be part of the instructor team for the four-day training workshop that targeted at least 25 network engineers from the RENU community. 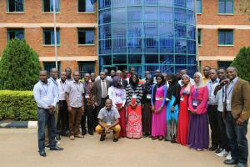 The training was followed by a Direct Engineering Assistance (DEA) exercise that sought to redesign the campus network at the Islamic University in Uganda (IUIU)-Mbale campus from 11-14 April 2016. In the aftermath of the training and the DEA, RENU Chief Technical Officer Nicholas Mbonimpa is impressed with the arrangement between the two NRENs saying the exchange of personnel is good for building technical competence between RENU and ZAMREN. Mbonimpa also believes such an arrangement can help NRENs build a community of experts within the region, a development he believes can offset operational and maintenance costs that NRENs incur when seeking networking expertise from outside the region. The CTO expressed gratitude to ZAMREN and to Mukwesa for accepting to attend the workshop and revealed the two NRENs are now looking at integrating different services that can be used by the two NRENs that are both connected by the UbuntuNet backbone. On his part, Mukwesa hailed RENU for inviting ZAMREN and allowing him to be one of the facilitators to the workshop while ZAMREN Chief Technical Officer Stein Mkandawire commended the relationship that exists between the two NRENs saying it is important for the progress of both NRENs. According to Mbonimpa, the “Scalable Campus Network Design” focused on underlying features of data networks at layers 1,2, and 3 of the OSI model and also on best practice guidelines of designing campus networks that scale easily. This NREN exchange programme in capacity building is facilitated through a fund granted to UbuntuNet Alliance by NSRC. With this fund, the Alliance pays for the costs of bringing a trainer from one NREN to support training activities in another NREN.